I am posting an excerpt of a report originally posted on truthout. What is happening in New Jersey is similar to what occurred in Chicago when the now Secretary of Education Arne Duncan was then the CEO of Chicago Public Schools, see Arne Duncan and the Chicago Success Story: Myth or Reality? and Catalyst’s In-Depth report of Arne Duncan’s Renaissance 2010, the plan for Chicago schools that he rolled out as CEO of the Chicago Pubic School system. He heralded his plan as a success and his appointment to Secretary of Education was based on this so-called “success”. Is this what we want for Seattle? 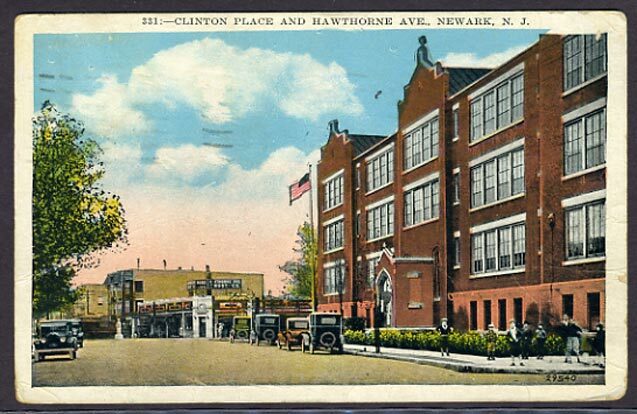 A Newark Public School at Clinton Place & Hawthorne Avenue in Newark, NJ, 1929. This investigation could illuminate the structural forces behind Newark school reforms. Though there’s been ample media coverage of the city’s noisy school politics – from Mark Zuckerberg’s $100 million gift to this year’s contentious mayoral election– so far, these structural forces remain opaque. But an in-depth look into the district’s ultimately unsuccessful attempt to close one South Ward school reveals how real estate concerns and facilities funding increasingly drive neighborhood school closings and the expansion of privately managed charter schools. By allocating millions of dollars in little-known bonds exclusively to charters while imposing austerity on public facilities, the state has quietly stacked the deck for charters, leaving neighborhood schools to molder in decline. Times were tough for the Choice family in 2011. Just months after a home invasion forced them to relocate to a new neighborhood, 10-year-old DeVahna was hit by a car and hospitalized for weeks. But DeVahna and her younger brother Darius, now12 and 9, found a second home in the K-8 Hawthorne Avenue School. “The school went out of its way to accommodate DeVahna,” their mother Jacqueline Choice says. Teachers visited the home to keep DeVahna abreast of material she’d missed. When she returned to school temporarily in a wheelchair, staff and students diligently volunteered to carry her books and bring her lunch. At the next board meeting, Superintendent Cami Anderson announced publicly what DeVahna had learned from her math teacher: Hawthorne would be handed over to a charter school, TEAM Academy, in a so-called “charter launch.” The staff would be replaced. All told, the district’s plan would impact a third of Newark’s schools. Built in 1895, Hawthorne has withstood everything from the Federal Housing Administration’s near-complete redlining of the city and the exodus of the white middle class, to the riots of 1967 and long decades of economicmalaise that followed. In 2011, came the Booker-Zuckerberg philanthropic blitz and Gov. Chris Christie’s appointment of Superintendent Anderson, all aiming to transform the state-run district into an educational free market. That means replacing “failing” district schools with charter schools, which are privately managed, publicly funded and freed from certain regulations. The full answer, it turns out, has little to do with educational performance. It has more to do with budget priorities in the age of Christie. Hawthorne hoped to ride out these reforms unscathed. Since Principal H. Grady James arrived in 2011, the low-income school has seen “an amazing transformation,” says a Hawthorne teacher (who asked to remain anonymous). Though it falls short of state averages, Hawthorne posted test scores last year that put it in the 94th percentile statewide in terms of student growth, outstripping all its Newark peers. The district justifies the move in part by pointing to the roughly 40 percent of South Ward families who sit on the waiting lists for charter schools they’ve chosen. But on the whole, Hawthorne’s parents chose Hawthorne. Families boycotted school applications, held weekly protests and fired off countless letters to state officials. Choice began speaking out at board meetings, eventually joining the civil rights complaint that spurred the federal investigation. That question vexed the community. The full answer, it turns out, has little to do with educational performance. It has more to do with budget priorities in the age of Christie. Though Newark Public Schools (NPS) claims to use seven criteria for school turnover decisions, “No one question pulled the lever” for Hawthorne, says Gabrielle Wyatt, NPS executive director of strategy. But it’s clear that one factor played an outsized role: money. Given the state funding landscape, NPS saw moving a charter in as a way to secure pressing building repairs. Hawthorne’s spacious brick schoolhouse is crumbling. Thick layers of paint slough off in the stairwells. A browning hole in the third floor ceiling oozes over a water fountain. Charters’ access to bonds allows them to “improve these community assets” – that is, school houses – “and allows the district to continue to operate. And keeps the district viable.” This saves the state, which controls Newark schools, from paying to fix the very schools it let fall into disrepair. Bringing a charter into Hawthorne could allow the state to scrimp on renovation costs. Charters’ access to bonds, Roberts says, allows them to “improve these community assets” – that is, school houses – “and allows the district to continue to operate. And keeps the district viable.” This saves the state, which controls Newark schools, from paying to fix the very schools it let fall into disrepair. When a charter school moves into a new building, it’s not unusual to see millions of dollars poured into renovations ranging from structural repairs to slick paint jobs. In the case of a school like Hawthorne, plugging the leaky ceilings and safeguarding against mold would likely be top priorities. Of the $440 million in QSCBs New Jersey received, nearly three-quarters have been approved – and so far, every penny has gone to charters. TEAM Academy alone gobbled up $138 million. This exclusive allocation of QSCBs to charter schools is highly unusual. California and Texas, for comparison, each allocated less than one-fifth of their QSCBs to charter schools. Just as New Jersey earmarked its federal school bonds for charters, Christie was busy slashing education budgets and hobbling the department charged with repairing needy urban schools. And creative they’ve been. Newark charters have become “infamous for being able to leverage their bonds to flip buildings,” says Wyatt, and some of the city’s most contested charter projects have been buoyed by QSCBs. When NPS sold 18th Avenue School, a district school it had just closed, to TEAM Academy, the charter used $40 million in QSCBs to finance it. As New Jersey muckraker Bob Braun detailed, the deal’s interested parties traced an eyebrow-raising constellation of tightly-connected players across the Jersey political spectrum. The sale engendered a complex of nonprofit and for-profit entities to navigate the regulatory environment. There were corporate interests like Goldman Sachs, nonprofit spinoffs with names like Kingston Educational Holdings, and even a profit-making company created specially for the deal, Pinkhulahoop1, LLC – whose partners all serve in various capacities at TEAM Academy. Take Tim Carden, who formerly sat on New Jersey’s Economic Development Authority, the body responsible for approving school bonds. Carden is also the chairman of the board of Friends of TEAM Academy, the charter’s fundraising arm. Or take Dan Adan, another partner at Pinkhulahoop1, who splits his time between Manhattan hedge fund Perry Capital and TEAM Academy’s board – where Carden’s wife Amy Rosen also happens to sit. TEAM has justified the dizzying arrangement by explaining that, in the end, it “saved millions of dollars compared to a typical financing.” It’s a luxury the district schools aren’t afforded. Just as New Jersey earmarked its federal school bonds for charters, Christie was busyslashing education budgets and hobbling the department charged with repairing needy urban schools, the School Development Authority (SDA). Established in 2000 to remedy stark funding disparities, the SDA controls billions of dollars for construction in disadvantaged districts. When Christie entered office, he shrunk the department’s staff by 30 percent and restricted its outlays to a trickle. “Basically there wasn’t any work being done,” says Moriah Kinberg of Healthy Schools Now, a coalition that advocates for school repairs. While over 700 projects broke ground in the decade before, not a single project was initiated and completed between 2010 and 2013. NPS shares Kinberg’s frustrations. “It’s like trying to put out a fire with a teaspoon of water,” says Wyatt. The district estimates its aging schools need over $1 billion in repairs. In 2011, NPS submitted more than 100 urgent requests for repairs, particularly masonry projects (several Newark schools currently sport scaffold-like “bridging” to protect children from crumbling edifices). After a yearlong delay, the SDA approved 17 projects, including structural repairs at Hawthorne. But the project was delegated to NPS to begin. And Hawthorne is still waiting. She’s not far from the mark. NPS officials, taken with downtown development efforts, say that the Hawthorne charter launch fit into a broader South Ward revitalization effort. Both Choice and NPS cite the same project as a harbinger for South Ward development: the Teachers Village. Initiated in 2012, the $150 million property contains three charter schools, teacher residences and sundry private businesses. The Manhattan-based developer secured over $100 million in public monies for the project, including over $20 million in QSCBs. By systematically underfunding the public sector while extending market incentives to private actors, the Christie administration has essentially placed its thumb on the scale for charters. Revitalization, of course, looks different depending on whom you ask. Choice sees it as an effort “to push us out of here so that they can rebuild this area.” The district disputes this characterization: Development in the South Ward, NPS argues, will treat residents to the kind of resources downtown Newark currently enjoys. It goes without saying that this kind of redevelopment requires roping in charter schools. But it’s also understood that neighborhood schools like Hawthorne get shouldered aside. The push for charter schools rests on the notion that parent choice ought to dictate which schools open and close. Families, says NPS, are “voting with their feet” in choosing charter schools (the feet marching outside of Hawthorne don’t count). But the fact that New Jersey stoppered facilities funding while directing $300 million in bonds to charters gives the lie to the notion that charters and district schools compete on a level playing field. As dilapidated neighborhood schools importune the SDA for urgent repairs, charters watch major construction projects break ground through no-interest loans not available to schools like Hawthorne. It’s a familiar pattern. By systematically underfunding the public sector while extending market incentives to private actors, the Christie administration has essentially placed its thumb on the scale for charters. The result: Some charters enjoy gleaming new facilities (bankrolled by the same financial milieu that spends its down time plugging them), while the public sector continues its decline. For its part, the district rejects the notion that it’s charging toward its own obsolescence; at the very least, its hands are tied. The state determines charter growth at the same time it disburses facilities funds, leaving Newark little wiggle room. Still, NPS isn’t entirely blameless. Its “portfolio” model of school governance treats schools like financial assets rather than like the individual communities they are. While it speaks of expanding “school options” and following “demand,” it evinces little interest in non-market options or in democratic demands. In the last week of school, Hawthorne parents and teachers received some welcome news: Superintendent Anderson announced that “due to family demand,” Hawthorne would remain unchanged next year. It was a victory for the parents like Choice, who battled the notoriously unyielding superintendent for months. State officials reportedly pressured Anderson to “extend an olive branch to Hawthorne,” the teacher says. But the announcement mentioned the 2014-2015 school year only. “It doesn’t mean we don’t go through the same battle again next year,” says the Hawthorne teacher. To read this report in full, go to truthout.